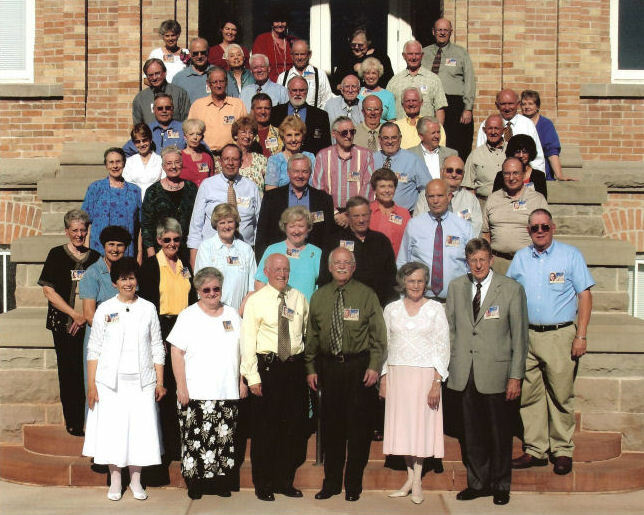 BYH Class of 1957 Reunion in 2007 (left to right):~ Back row: 1. Joan Crowther Hamilton, 2. Hannah Olyroyd Jorgensen, 3. Connie Bills Hinckley, 4. Bonnie Ballif Spanvill, 5. Delbert Brown. ~ 7th Row: 6. David Sorensen, 7. Carol Lynn Wright Pearson, 8. Larry King, 9. Dale Longhurst, 10. Kelly Ashby Strong, 11. John Muirhead. ~ 6th Row: 12. Richard Hartvigsen, 13. David Hamblin, 14. Darryl Steele, 15. Mr. Verl Allman (teacher). ~ 5th Row: 16. Robert Redd, 17. Ted Dowling, 18. Roland Clark, 19. David Grow, 20. Lanny Britsch, 21. Aniene Andrus Porter. ~ 4th Row: 22. Mary Allen Redd, 23. Gaile Woodruff Clark, 24. Alene Gleason Hone, 25. Pam Gease Gates, 26. Larry Taylor, 27. Boyd Bauer, 28. Ron Taylor, 29. Mike Jones, 30. Lois Anderson Hayward. ~ 3rd Row: 31. Mary Anne Keeler Jolley, 32. Leda Law Muhlestein, 33. Larry Murdock, 34. Ken Bentley, 35. Joan Peterson Fisher, 36. Joe Gammett, 37. Doug Jones. ~ 2nd Row: 38. Kolleen Johnston Smith, 39. Laura Jo Dunkley DeMordaunt, 40. Virginia Clark Bragg, 41. Liane Harding Solomon, 42. Sharon Jewett Mathews, 43. Larry Nelson, 44. David Morrill. ~ 1st Row: 45. Sonja Whittle Peterson, 46. Nelda Graham Mackay, 47. John Swensen, 48. Don Swensen, 49. Suzanne Calder Leichty, 50. R. D. Muhlestein, and 51. Gary Boyden. 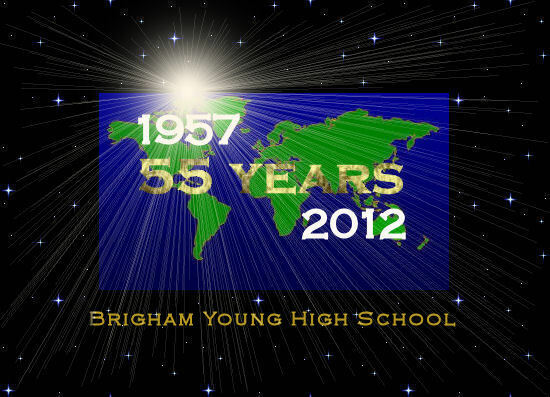 The Class of 1957 has kept track of 113 alumni, including all those who graduated, and all those who attended BYH at any time during high school. -- 45 spouses & friends. Began mingling at 4:30 p.m.
Lanny Britsch (Class President) Master of Ceremonies. John Swensen & Joan Crowther Hamilton welcomed everyone. Hannah Oldroyd Jorgensen sang �My Favorite Things� (lyrics by Julie Andrews). A buffet dinner was served. 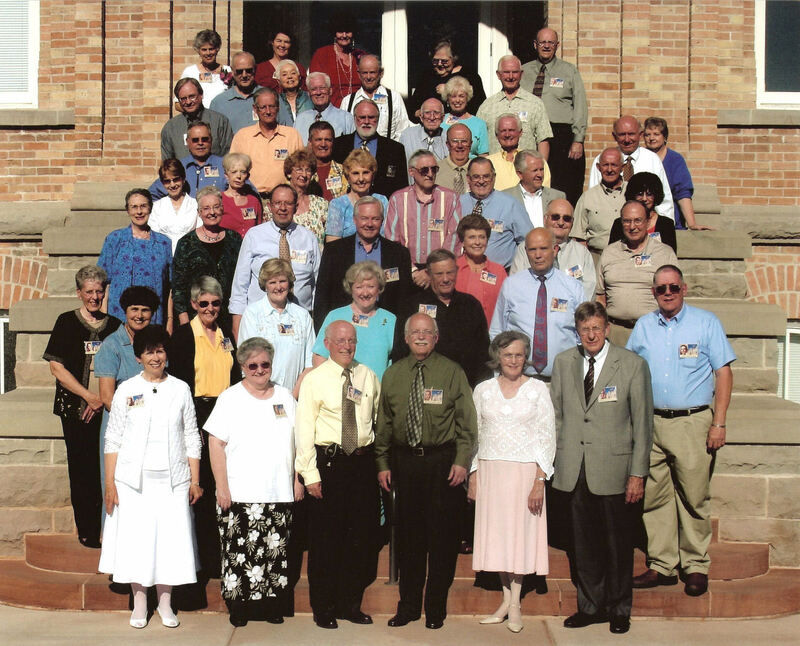 An a cappella group -- the �Cadillac�s� -- sang 1950�s songs. Carol Lynn Pearson read entries from our old "Y�ld Cat� newspapers. 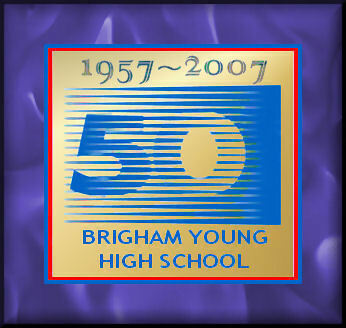 The �Brigham Young High School Class of 1957 Golden Jubilee Memories� booklet was distributed as everyone departed at around 10:30 p.m.